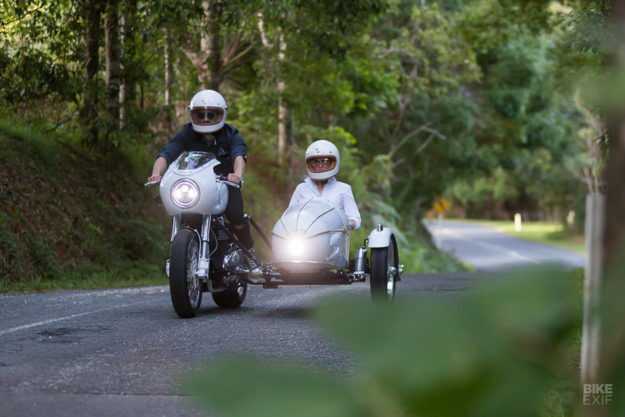 We love sidecars, but they’re usually sedate rather than sporty. 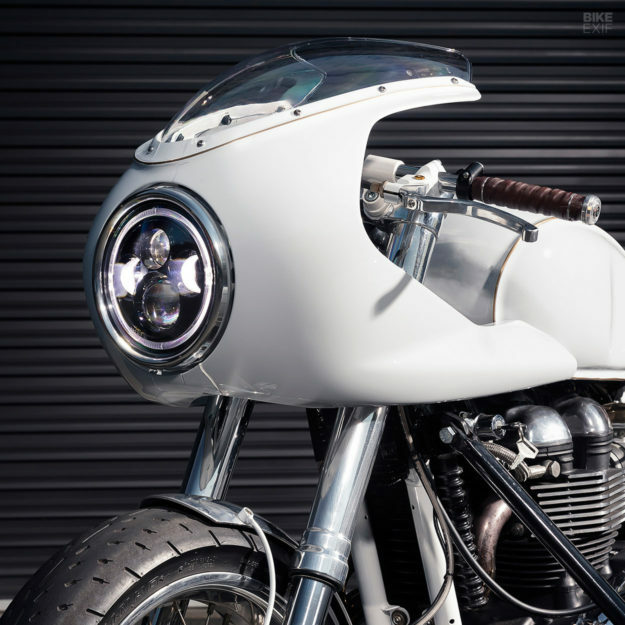 And a classic café racer with a chair? That’s even more rare. So we love the look of this most unusual combination from sunny Queensland in Australia. 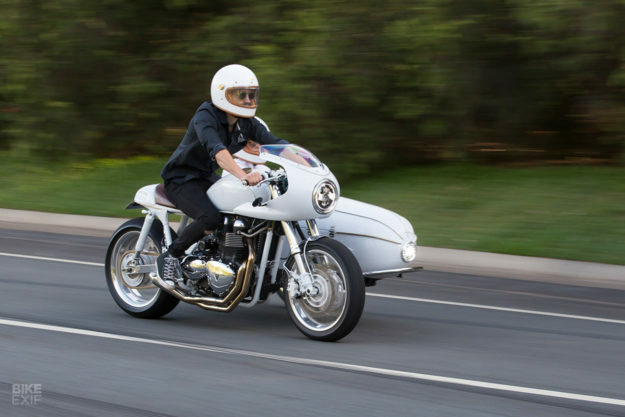 The ‘Cold Brew Cafe Racer’ comes from Tom Gilroy of Purpose Built Moto, and it’s built around a Triumph Scrambler. The project started like many others: A couple of blokes meeting up for a beer at their local haunt. Tom’s favorite spot is the iconic Sandbar restaurant in Surfers Paradise, on the famed Gold Coast stretch of Queensland. 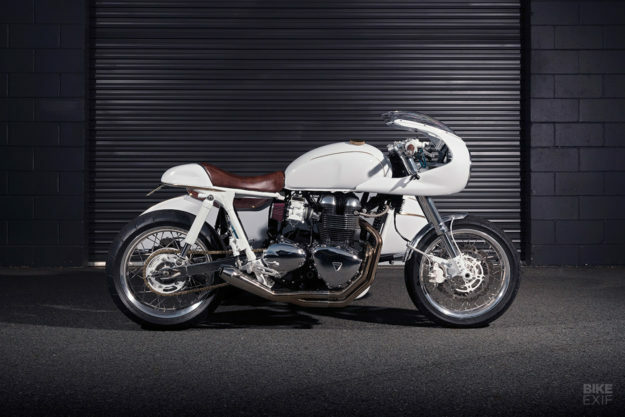 “I rolled up on my GS550 to see my mates Jake and Rich, who threw an idea my way,” Tom recalls. Jake’s family own the Sandbar, and the idea was to build a sidecar rig to deliver Vittoria Cold Brew Coffee to the coastal community. A deal was done: Tom would build the rig as a creative collaboration with the coffee company and the restaurant. And all agreed that the bike had to perform with and without the sidecar. “When it’s not delivering a morning boost to Gold Coast residents out walking their trophy dogs, it has to handle a fast-paced Sunday afternoon run over the mountains!” says Tom. 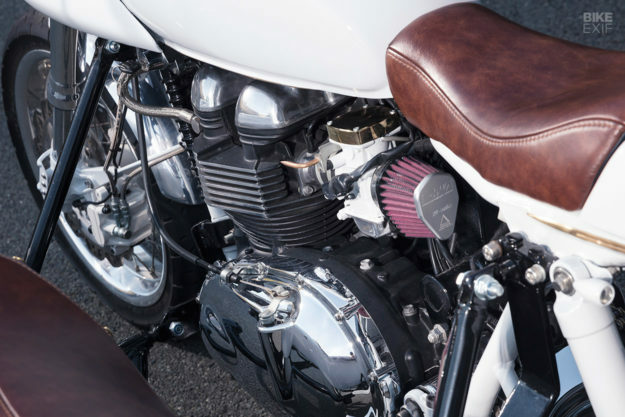 The donor was a 2009 Triumph Scrambler, with the air cooled 865cc parallel twin—and a 270-degree firing interval for that famous exhaust note. 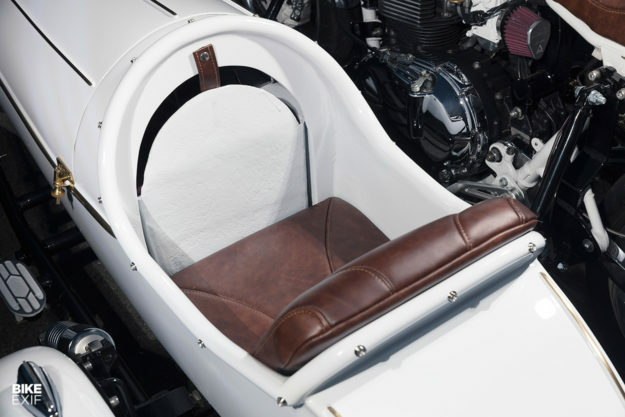 A Cozy sidecar would be attached, mimicking the style of the vintage Steib 350 and 500 series sidecars. 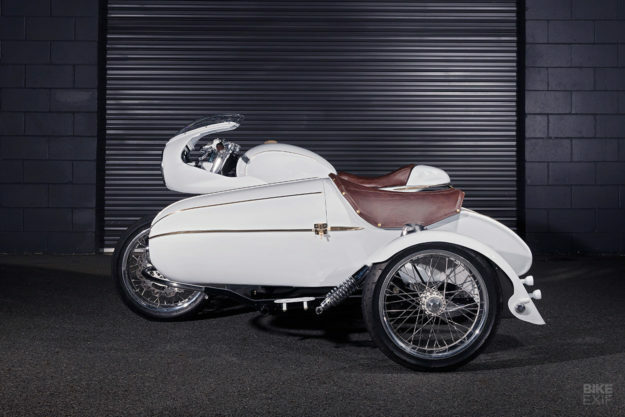 Tom wanted a timeless look that never grows old: “A bit like a vintage Rolex.” While he set to work on the bike, he sent the sidecar body to a friend for a cleanup. The brakes and suspension were top of the to-do list. Tom’s given the Scrambler hefty 54mm polished USD forks and twin disc brakes from a Triumph Tiger, and a custom triple clamp. He’s also lowered the forks 40mm and rebuilt them to suit the ride height with the sidecar attached. New wheels were the next big ticket item: specially machined alloy soft lip rims, 17” x 3.5” at the front and 17” x 5.50” at the back, laced up to the existing hubs. The massive rear wheel was wrapped in Shinko Stealth 003 rubber and required sprocket offsets to fit. TIG welding brass to mild steel wasn’t the easiest feat, but after a few runs and stuff-ups, Tom got the hang of it. And then he added other brass details like custom-turned EFI choke and idle controls, EFI caps and a billet brass fuel cap. 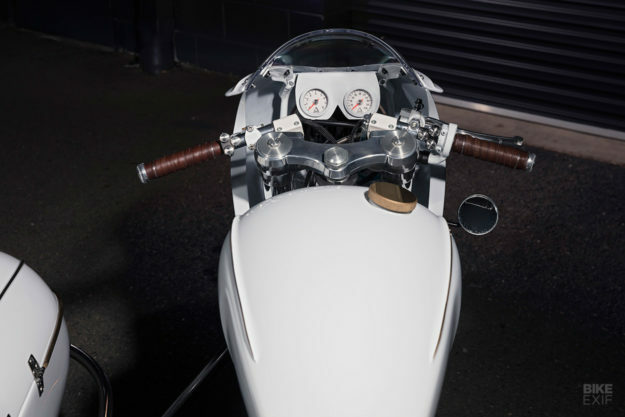 The final piece to finish off the silhouette was the front cowl, which is a 2017 Thruxton piece—modified to fit the front end, and housing custom PBM Speedhut gauges. Clip on bars are finished with new levers and PBM’s own minimalist button switches. The Tarrozzi rearsets are a very neat upgrade too, because Tom has repositioned the master directly above the right foot brake, eliminating the need for a clunky linkage. 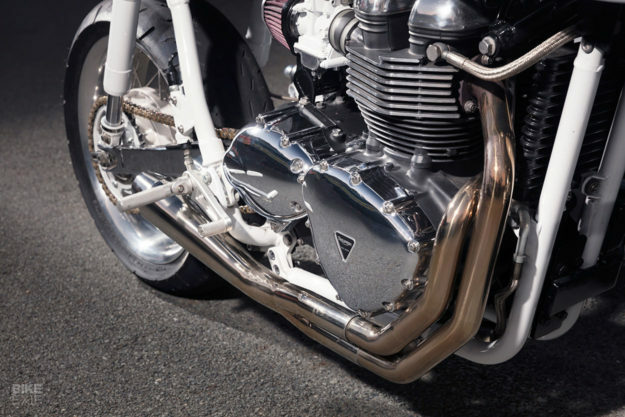 Tom has been dabbling in building exhaust headers, so he was determined to craft one for the Triumph in-house. He’s used a single sided 2-1 design with the collector placed just before the muffler—so the headers could frame the triangular stator covers. “When you hear it fire up [in the video below] you’ll see why we all love it so much!” says Tom. 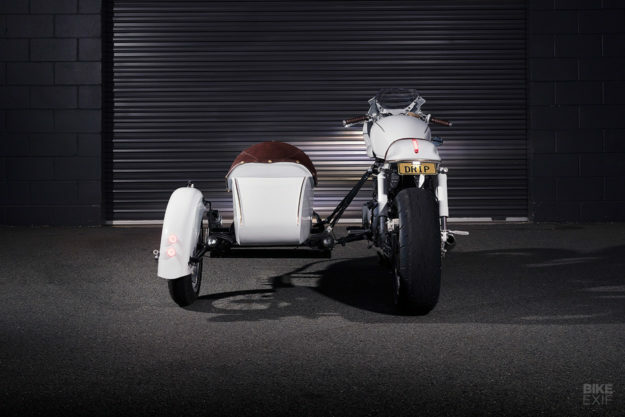 Tom pushed the sidecar opening back 400mm to achieve a bullet shape, and braced and hinged the body. This allowed room for a custom-built cooler to serve the bottles of cold brew. He also trimmed down the fender and installed new mounts, so the fender now moves with the wheel and hugs it tightly for a cleaner look. Extra lighting went in: a PBM 4.5“ LED headlight and a twin stack of prototype PBM Orbit Mini LED brake lights at the back. 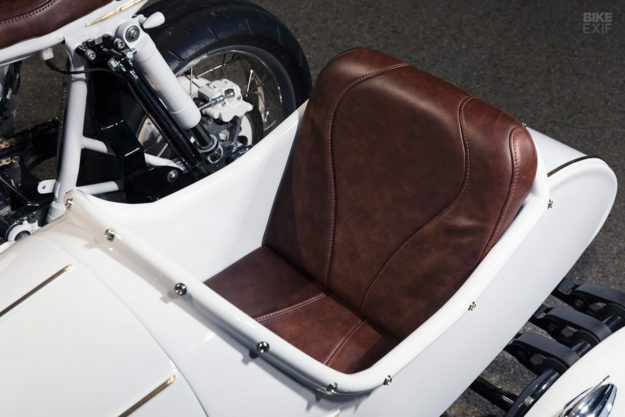 New brass rods shaped onto the sidecar body match the highlights on the bike, and there’s new upholstery inside—coffee brown leather and stitching. 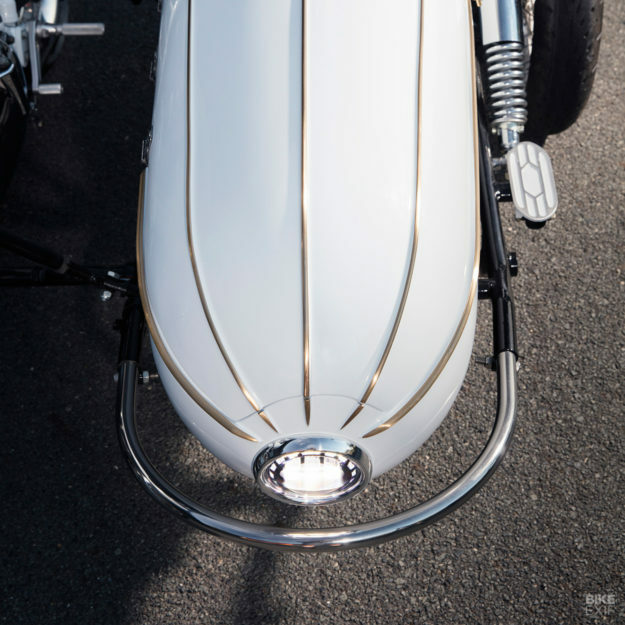 The final piece of the puzzle was the intricate sidecar alignment. “Having read through a few manuals on geometry and functionality, I figured I needed some advice from those who had done it before me,” Tom admits. 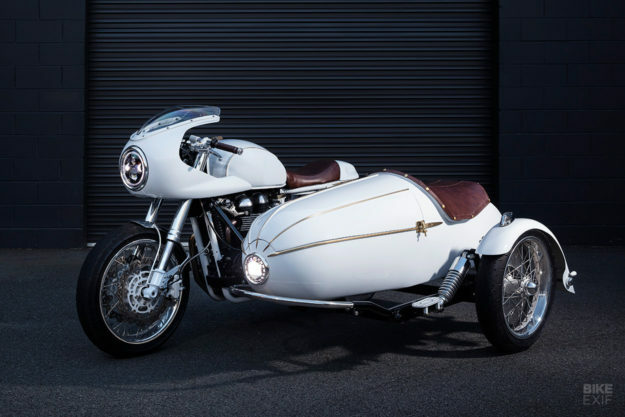 Tom reckons that riding the Triumph without the sidecar is an equally pleasurable experience, thanks to the suspension mods, dyno tuning and bellowing 2-1 exhaust. Sounds like the best of both worlds to us. We’ll drink to that.